The Auditorium of La Merced has hosted today, Thursday, San Lucas Day, Sanlúcar's Patron, the institutional act of delivery of the Gold Badges of the City. In the 2018 edition, the mayor of Sanlúcar, Víctor Mora, decreed the delivery of these distinctions to Mercado Montilla, Ateneo and CN Sanlúcar. Dozens of people gathered at the La Merced Auditorium, along with the members of the Municipal Corporation and representatives of different collectives, to attend the delivery of these distinctions. Víctor Mora was in charge of highlighting the reasons why the three entities have been awarded the highest distinction granted by the City Council each year, which belong to the fields of business, culture and sports. "Collectives," said the mayor, "which in turn encompasses different values ​​and brings together a large number of people committed to what they do, in short, of those who make a city, sharing a common goal, which is none other than progress and the progress of our beloved Sanlúcar. " He began by delivering the Insignia to the company of La Algaida Mercado Montilla, "a recognition that could be an entire area of ​​the city and part of its history." In his speech, the mayor stressed that it is the "sacrifice, work and delivery of many farmers," and recalled José Buzón Montilla, who along with his children José, Rafael and Diego were the precursors of the auctions of products in situ, with which the displacement problems of farmers in the area were solved when selling their products and the imbalance that there was until then in the prices of these. Today, they enhance the quality of the products of the area every day, the brand San Arenas Fine Arenas, is present in national and international fairs, expanding business areas, looking for customers, new opportunities and competing with many other companies on equal terms. terms. It is still a company "of a brave family that took the generational leap looking towards the future of the company" and that today direct their grandchildren Genoveva, Renata, Celia and Silvestre, who "lead a job generating company, a team of anonymous people that they are an example in values ​​of equality, that they fight every day to improve the service to their farmers, and that even today they continue being an institution as one day their grandfather was ". The logo was collected by Genoveva Buzón, director of the company, who thanked the recognition and work of farmers and the work team of the firm. The following award was received by the Athenaeum, an entity that has been fostering and boosting the culture of Sanlúcar since 1954. With a hundred members, it develops an incessant activity that includes the holding of conferences, round tables, debates, book presentations, exhibitions , projects aimed at cultural action, and convenes several awards throughout the year. In charge of the proclamation of the Manzanilla Fair for more than 30 years, was the creator of the Festival of Exaltation to the Guadalquivir and is one of the founding members of the Andalusian Federation of Athenians of Andalusia, which will celebrate its tenth annual meeting in Sanlúcar on the occasion of the V Centenary of the First World Tour of Magallanes and Elcano. In this regard, the mayor stressed that the Athenaeum, once again, "has reached out to both the City Council and other entities to work from the spirit of cultural cooperation for the commemoration of this event, forming part of the Advisory Commission of the V centennial ". Víctor Mora recalled Unamuno - "only he who knows is free, and freer he who knows best. Only culture gives freedom "- to remember the inspiring principle of the Athenaeum and thus justify the concession to this great entity of Sanlúcar. Its current president, Manuel Reyes Vara, was in charge of collecting the badge, thanking the municipal support and that of other institutions, companies and organizations, which contribute to the Ateneo being able to transmit culture. Finally, perhaps the most emotional moment of the event took place with the delivery of the Gold Badge of the City to the Sanlúcar Swimming Club and the memory of its late President Manuel Gallego. Víctor Mora defined the club as "a family with capital letters" and recalled his beginnings with the Club Picacho created by Jesús Villegas. Today there are around 100 swimmers and not only compete at the Andalusian and national level, but also has a Sanluque swimmer in the Spanish team that will compete internationally. The mayor encouraged to encourage the current leaders to follow the same path that until now, because "besides being a great family, you are an example to follow and a sporting reference, in which the main success of this project is its human capital "
They could not miss the words of remembrance to Manolo Gallego, "because talking about the swimming club, is talking about him". "He knew how to give the necessary encouragement to these boys and girls to improve themselves day by day; he made them understand the value of the competition; that all work had its reward and was responsible, together with Tere, to lead a large group of fathers and mothers who have filled the stands of all those places where their children have competed. A very special person whom we all miss and who spent many years of his life building a well-known club in Sanlúcar and outside the city, "he said. These peculiarities, together with the successes in the competition and a great community that educates in sports and family values, justify, said the mayor, the award of the Insignia, which the current president picked up the club remembering his predecessor and highlighting the qualities of effort and commitment that make this humble club one of the most outstanding. 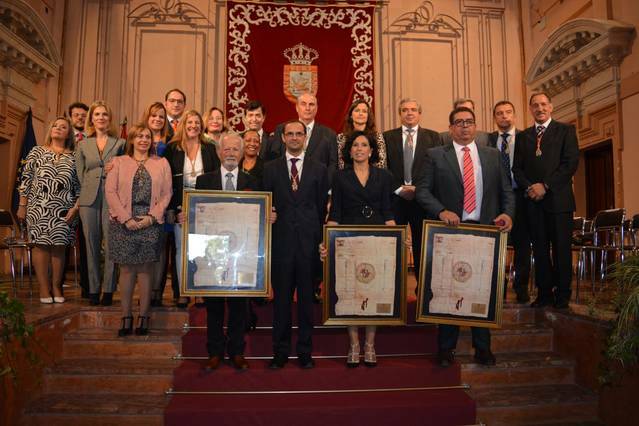 Along with the Golden Badge of the city, the honorees also received a copy of Privilegio Rodado de Sanlúcar.